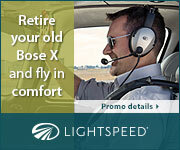 New Lightspeed Aviation Bose Trade Up | Avionics Blog – Avionics to the Max! We are excited to announce a new kind of Lightspeed Aviation promotion — a limited time Lightspeed incentive offer designed to allow pilots to switch from their old Bose X headset to the superior comfort and performance of a new Lightspeed Zulu 3 ANR headset. You may receive a maximum trade up value of $375 CDN credit when exchanging your current working Bose X headset towards a new Zulu 3. This entry was posted in Avionics News and tagged airplane, avionic system upgrades, Bose X headset, Canada, cockpit, efis, Flight Instruments, glass cockpit, GPS, Helicopter, Lightspeed, Maxcraft Avionics, tcas, trade up, VHF radios, Zulu 3. Bookmark the permalink.